The first thing we’re going to do is to log in as oneadmin to take a look at the Admin View of Sunstone, which has more options than the other Sunstone views for a regular users. Read the specific guide for your Sandbox: VirtualBox or AWS to know what IP to use. Check the “Keep me logged in” option to avoid problems with clock settings in the VM. Take a look at all the already bootstrapped resources in the Sandbox. The Cloud View interface is much simpler and targeted at end users. Create a new Virtual Machine by clicking the ‘+’ button. Select the only available template and click ‘Create’. After clicking create you will be taken to the dashboard where you can see your running VMs. With the oneadmin role you can customize what your cloud users can do and see. 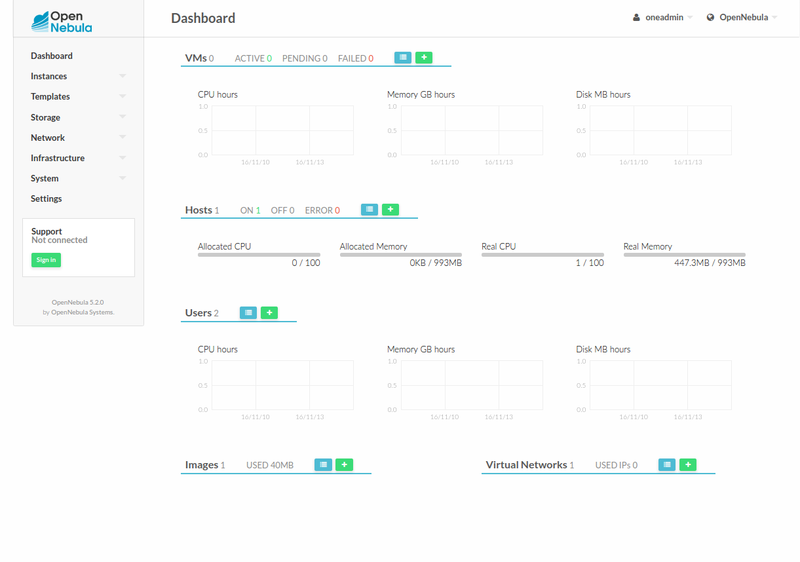 This is just a quick overview to get you started with OpenNebula. If you liked it, you may want to check the OpenNebula documentation for more information on how to deploy OpenNebula in your infrastructure and a detailed version of the OpenNebula features. Logs are located in /var/log/one. Be sure to check that in order to troubleshoot. If you need assistance, head out to our forum.